Demos are finally arriving on the 3DS’s eShop! Among the upcoming demos will be Mario and Sonic at the London 2012 Olympic Games, which will be debuting on both the American and European eShops. The American demo has been confirmed for release on January 26th, a few weeks before the full game is released at retail. A European release date has not currently been set. Are you guys going to download? I know I will. 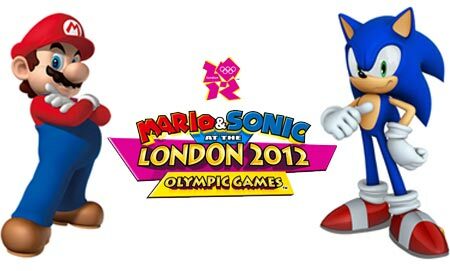 Mario and Sonic at the London 2012 Olympics will be available on Wii in November and 3DS February 2012. On Wednesday June 8th, Nuckles87 and I had just wrapped up a Q&A for binary Domain that ran ten minutes late. Sadly this meant we were late for our preview of Mario and Sonic London 2012. But as we entered the small room, the atmosphere was very jubilant and happy. The main host even ribbed me on my Classic Sonic shirt a few times ($7.50 at your local Wal-Mart kids!). He hadn’t revealed much yet as he just began discussing the newest addition to the series, the London Party Mode. The London Party Mode is a party/campaign mode separate from the Olympic/Dream modes in the game. Here, there are over 50 events available. Not just Olympic/Dream events, but all new mini games just for this mode! In fact, the majority of the 50 events are just for this mode alone. In the game, your character will be walking around the city of London shown from an overhead view. The main goal is to compete with your friends at winning stickers in events. You can talk to many Mario and Sonic characters who are not in the Olympic events such as Jet the Hawk and get mini-games to play from them. However, when Big Ben’s Bell Rings on the hour it’s time for an Olympic event. Also, new to this mode are bosses. First person to touch a boss (like Dry Bowser) gets to take them on in a on-on-one mini-game solo. There were quite a few of the four-player LPM events shown. One was called “Tag-O-Rama” a cops-and-robbers style game where two players are cops with a siren on their head and the other two are robbers. (Nack would be so perfect for this game.) You basically chase each other down in a game of tag. Whoever get both robbers, or whichever robber lasts without being tagged, is the winner. The next game shown was “Collect Toad’s Coins” which is basically self-explanatory. 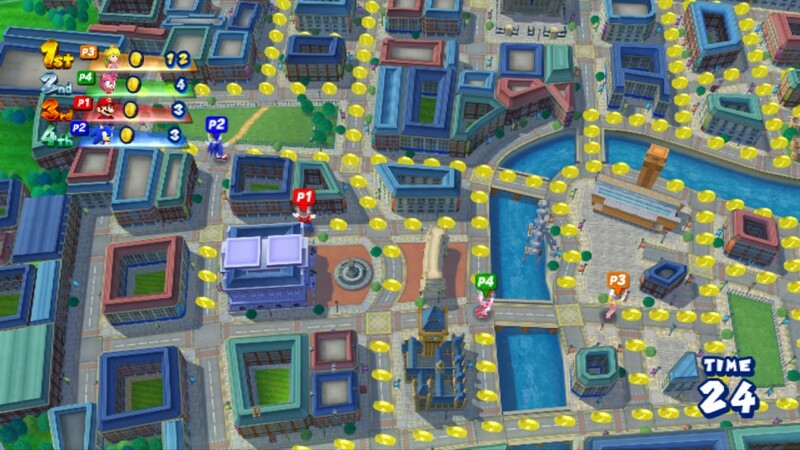 Four players are running around a large maze of the London City Streets collecting coins Pac-Man style and jumping on your opponents to get more coins from them. As you can guess, the person with the most coins at the end is the winner. Next up was “Break-Neck a-thon” Here, you brutally beat your opponent to the point where you could snap their neck. Killing them inst-OKAY! OKAY! Just kidding! It’s a hurdles style marathon race taking place on the city streets. You have to jump and dodge various obstacles as much as possible as you run towards the goal. That was the end of our preview of the London Party Mode. Next up, we got to see some exclusive events that were not on the floor. The first was “Ribbon Twirling”. Very similar to the figure skating in the last game. The host played as Peach (Nuckles really wanted Shadow doing it) as she danced and twirled the ribbon to some classical music. Once again, timing and rhythm was key to a good score. Finally, we got to see a new Dream event. “Dream Equestrian”. A 4-player co-op game in which the players must take a cart of Yoshi Eggs from one area to another. The trick is that they have to turn, jump and do other tricks at the same time. The crew on hand really loved this game despite the fact that they were horrible at it. “There’s a dozen Eggs in the basket when you start. Our best score in the last two days has been three.” They took off! A Koopa wizard was creating hazards for them as they raced along. It didn’t take long before mass Yoshi egg genocide commenced. Sadly, at the finish line there was just one egg left. Despite the fact that everyone had been playing this mode over and over the past two days, they seemed to really be enjoying themselves. With the game over, our Q&A was on it’s way. The dream events were very popular in the last game, will we be seeing more of that? Much more. There will be a bigger focus on dream events this time with a larger number of events. Will the games in London Party mode be different from the ones in the Olympic events? Yes. It’s almost a separate game entirely. The only similarities is in the occasional Olympics event when Big Ben strikes. 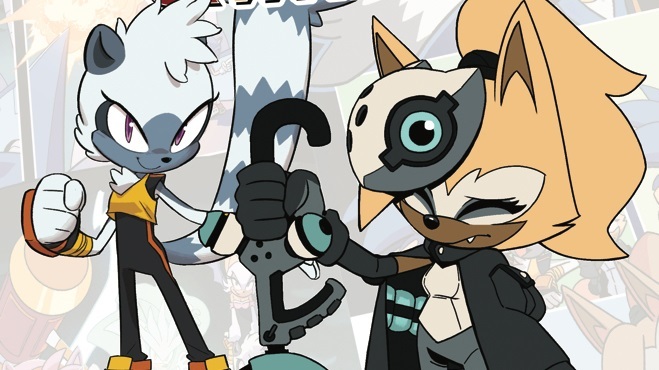 Any new entries to Mario and Sonic’s roster? No. We wanted to mainly focus on adding new events to the game so the roster is the same as the previous game. You will see some newer NPC’s walking around London that you can talk to. This seems very much like a “Mario Party” style of game now. Since people love the dream events as well, any chance of a pure, non-Olympic M&S party game? I’m sure people would love that, but there’s no plans at the moment. Since Mario and Sonic relies heavily on multiplayer, any chance of an online mode this time? We will have online rankings, but no multiplayer. Will the music in events like Ribbon mode change, or remain the same? It will definitely change depending on what difficulty you play on. With the Wii U recently announced, what kind of games would you like to make with that style of controller? We don’t have any plans with the Wii U currently, so we can’t really get into that. Sadly, our time was over before we got any more questions in. 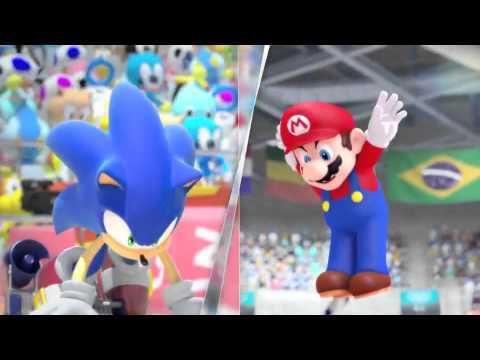 Mario and Sonic at the London 2012 Olympics is looking to turn into more of a party game than an Olympics game this year. Also, the new mini-games and events look more fun than ever. The party in London begins this November.